Concomitant use of strong inhibitors of CYP2C8 (eg, gemfibrozil) with UPTRAVI is contraindicated. Should signs of pulmonary edema occur, consider the possibility of associated PVOD. If confirmed, discontinue UPTRAVI. 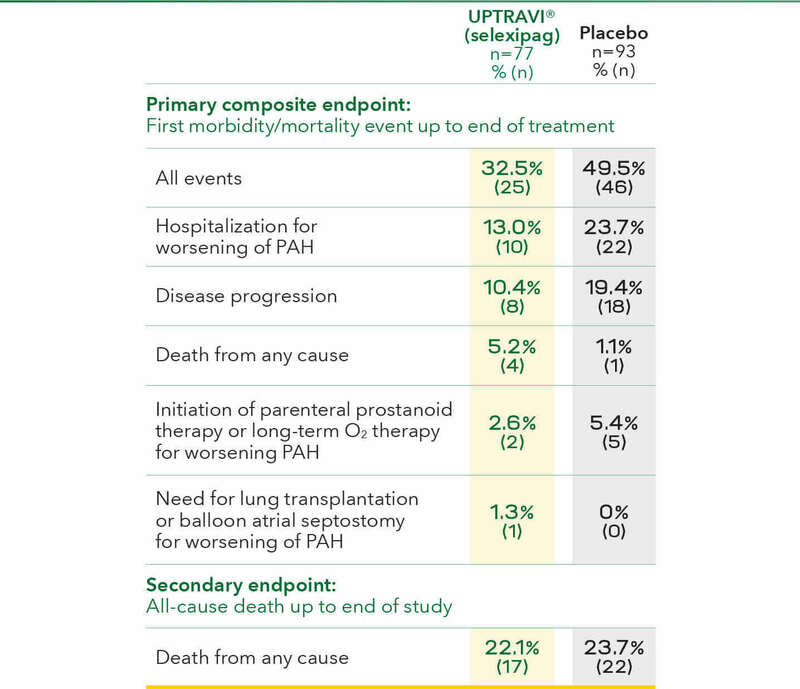 Adverse reactions more frequent compared to placebo (≥3%) are headache (65% vs 32%), diarrhea (42% vs 18%), jaw pain (26% vs 6%), nausea (33% vs 18%), myalgia (16% vs 6%), vomiting (18% vs 9%), pain in extremity (17% vs 8%), flushing (12% vs 5%), arthralgia (11% vs 8%), anemia (8% vs 5%), decreased appetite (6% vs 3%), and rash (11% vs 8%). These adverse reactions are more frequent during the dose titration phase. 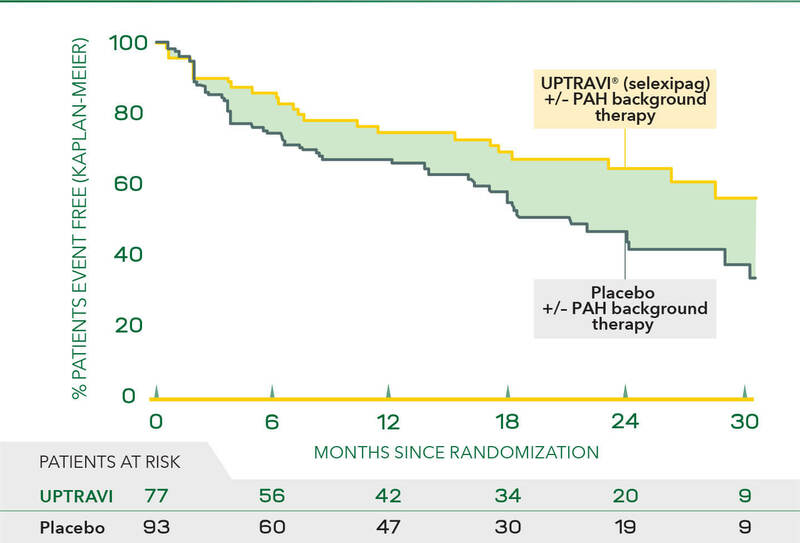 Hyperthyroidism was observed in 1% (n=8) of patients on UPTRAVI and in none of the patients on placebo. 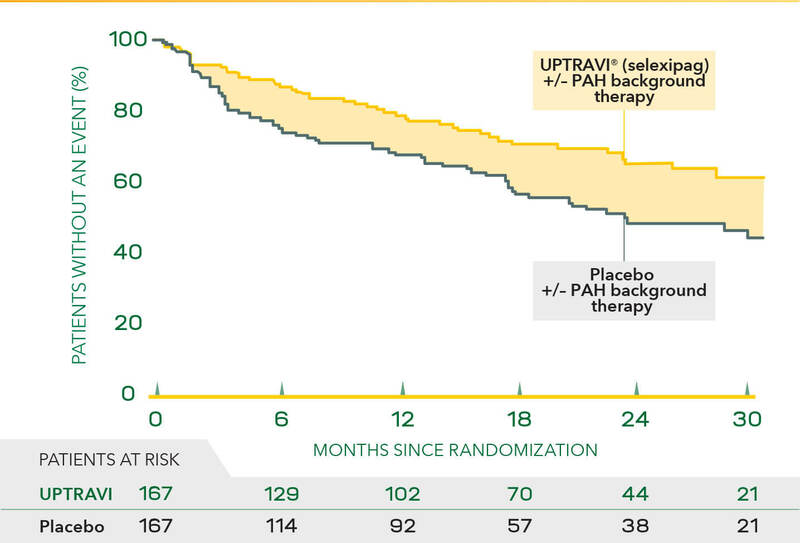 UPTRAVI® (selexipag) is indicated for the treatment of pulmonary arterial hypertension (PAH, WHO Group I) to delay disease progression and reduce the risk of hospitalization for PAH. 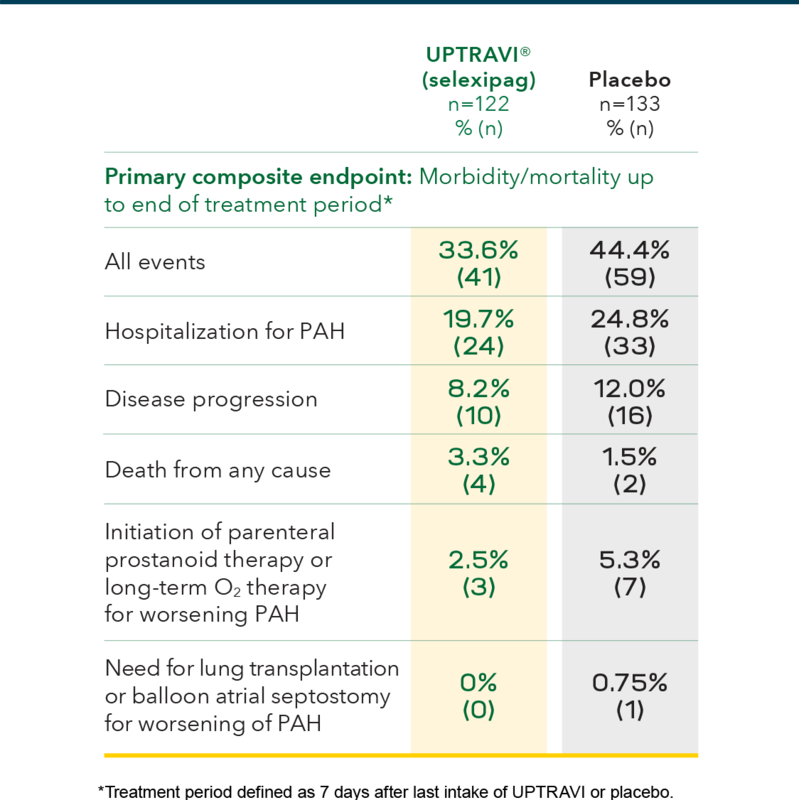 Effectiveness was established in a long-term study in PAH patients with WHO Functional Class II-III symptoms. Patients had idiopathic and heritable PAH (58%), PAH associated with connective tissue disease (29%), and PAH associated with congenital heart disease with repaired shunts (10%). Concomitant administration with gemfibrozil, a strong inhibitor of CYP2C8, doubled exposure to selexipag and increased exposure to the active metabolite by approximately 11-fold. 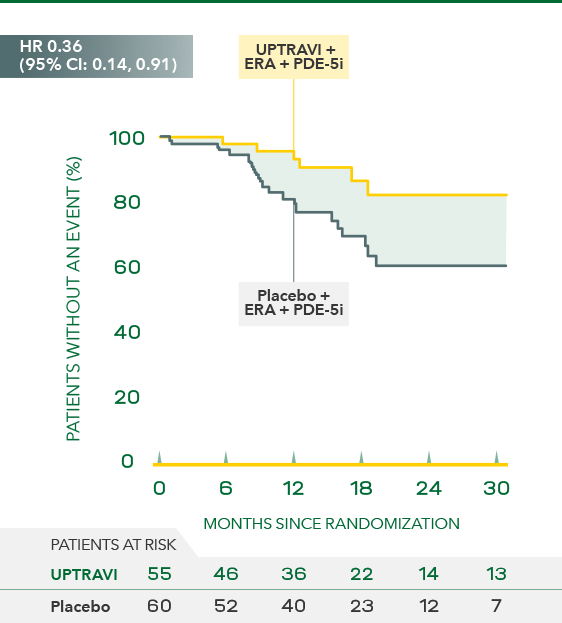 Concomitant use of UPTRAVI with strong inhibitors of CYP2C8 is contraindicated. 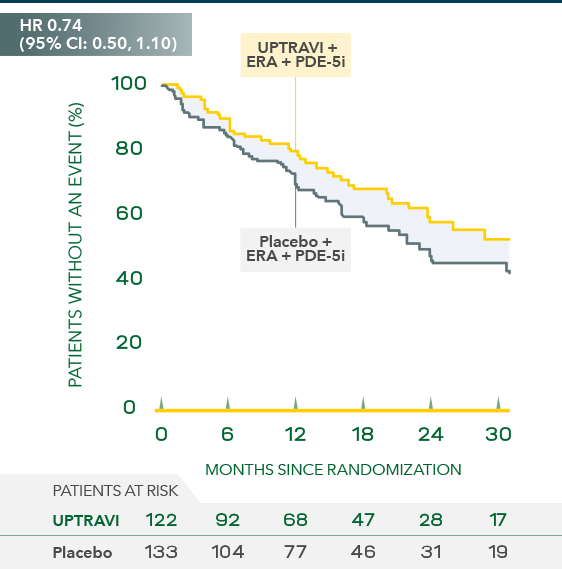 Although not studied, use of UPTRAVI with moderate CYP2C8 inhibitors (eg, teriflunomide and deferasirox) can be expected to increase exposure to the active metabolite of selexipag. Consider a less frequent UPTRAVI dosing regimen, eg, once-daily, when initiating in patients on a moderate CYP2C8 inhibitor. 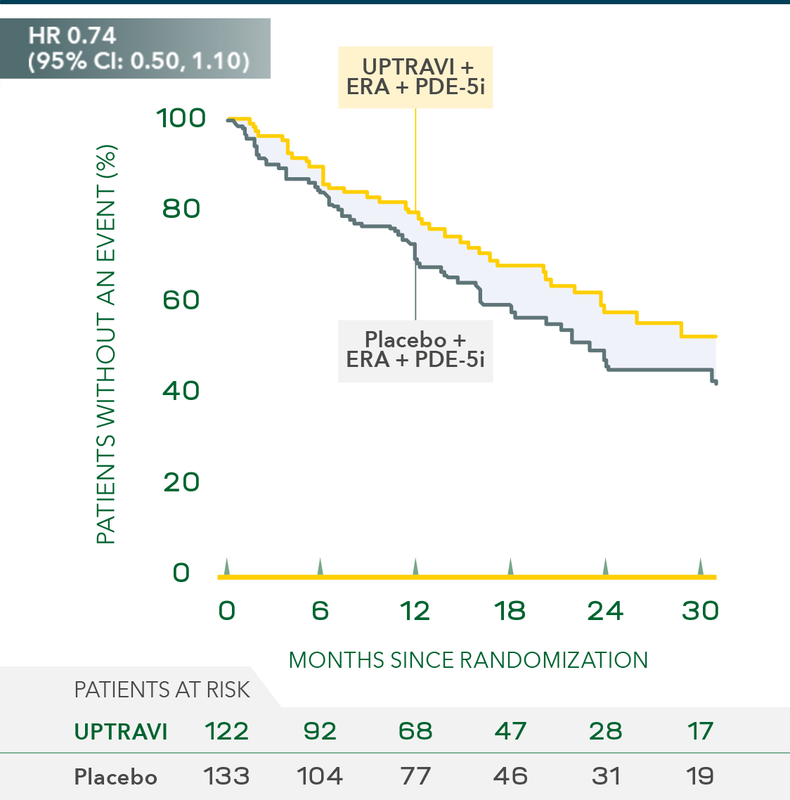 Reduce UPTRAVI when initiating a moderate CYP2C8 inhibitor. 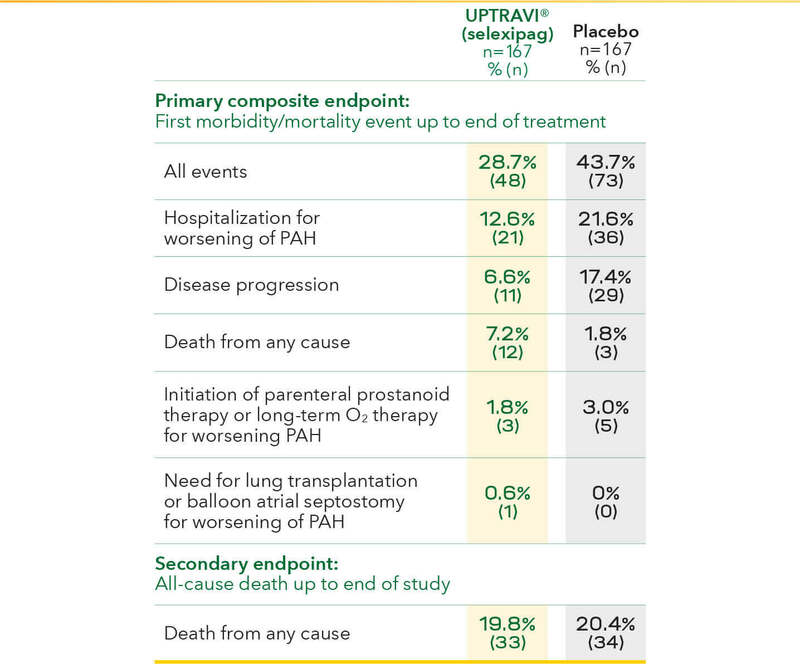 Concomitant administration with an inducer of CYP2C8 and UGT 1A3 and 2B7 enzymes (rifampin) halved exposure to the active metabolite. 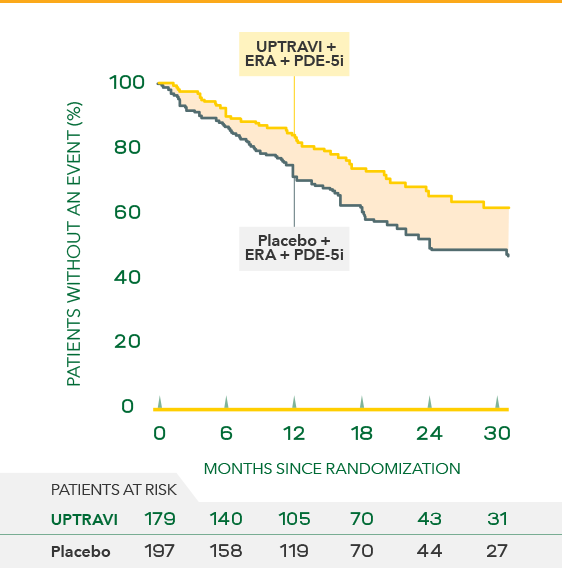 Increase UPTRAVI dose, up to twice, when co-administered with rifampin. Reduce UPTRAVI when rifampin is stopped. Recommended starting dose is 200 mcg twice daily. Tolerability may be improved when taken with food. 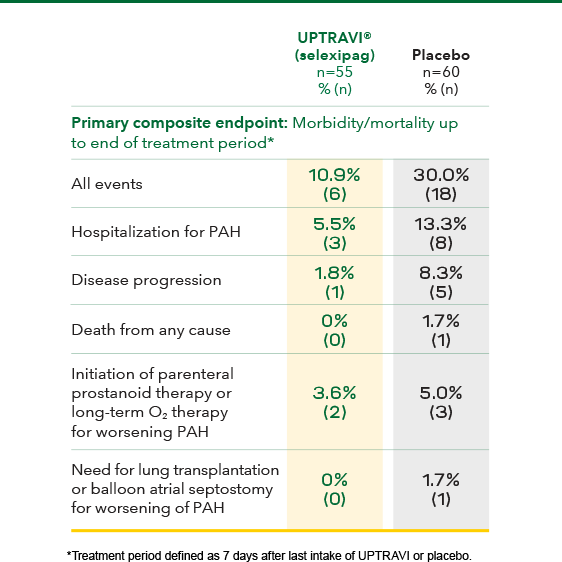 Increase by 200 mcg twice daily, usually at weekly intervals, to the highest tolerated dose up to 1600 mcg twice daily. If dose is not tolerated, reduce to the previous tolerated dose. 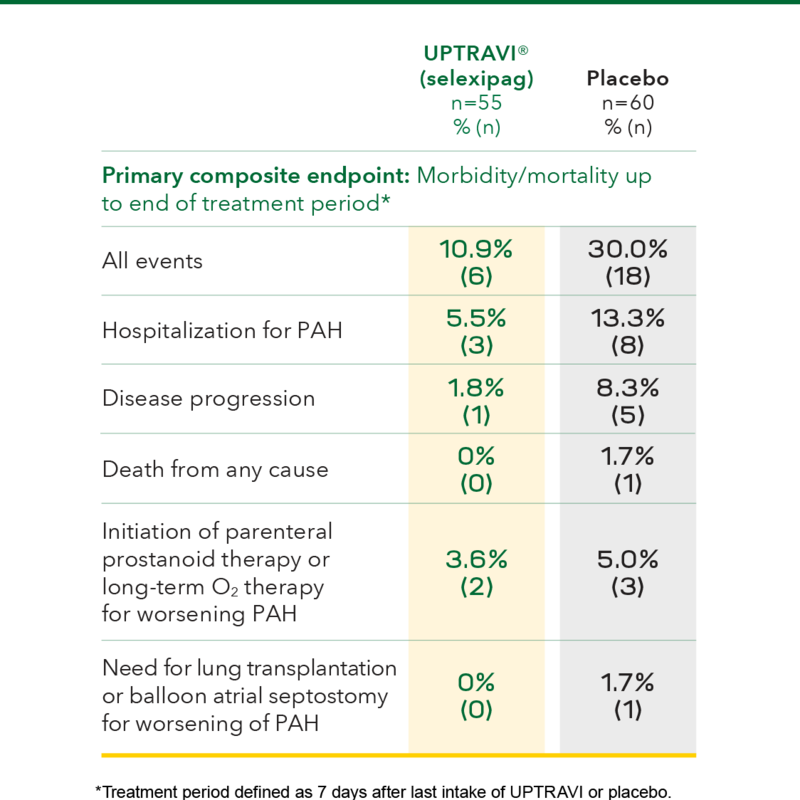 For patients with moderate hepatic impairment (Child-Pugh class B), the starting dose is 200 mcg once daily. Increase by 200 mcg once daily at weekly intervals, as tolerated. 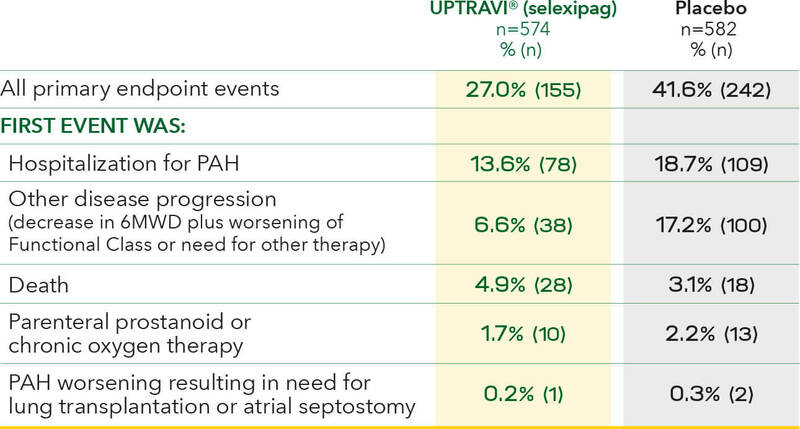 Avoid use of UPTRAVI in patients with severe hepatic impairment (Child-Pugh class C). 200, 400, 600, 800, 1000, 1200, 1400, and 1600 mcg. The following form is intended for use with patients who are eligible for VA benefits only. 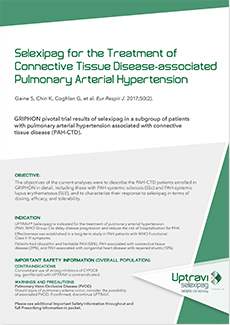 Fill out the form below to have an UPTRAVI® (selexipag) sales representative deliver a reprint of the European Respiratory Journal publication.